(Photo: LCCN / LWF Felix Samari)Nigerian Lutheran (LCCN) Archbishop Nemuel A. Babba during the church's February 19 to 23, 2014 convention in northeastern Nigeria. When Nigeria's Lutherans held their annual convention recently they say it drew around one million believers in their land where Christians, and also Muslims face an onslaught from extremist Islamists. 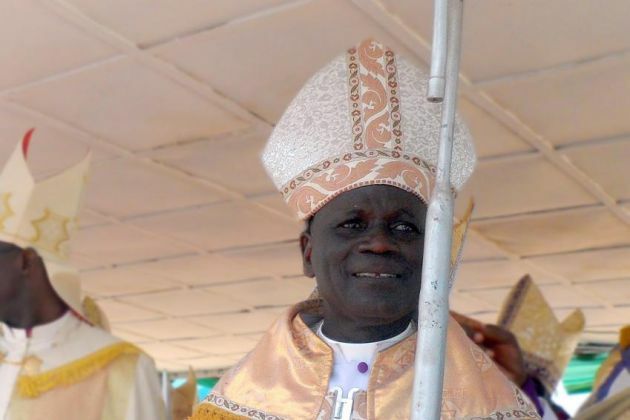 The Lutheran Church of Christ in Nigeria held its annual convention, 19-23 from February 19 to 23 in Demsa, Adamawa State, in the northeastern part of the country. LCCN Archbishop Nemuel A. Babba told Lutheran World Information it was the largest-ever gathering in the church's history at a time when he said, "The church is being persecuted." He said it symbolized standing "firm as Christians", and the church's responsibility in enhancing peace and reconciliation in "a worrisome context." "Today, if you hear his voice, do not harden your hearts," from the Bible's book of Hebrews (4:7) was the theme for this year's meeting," said the Lutheran leader. "We [LCCN leadership] chose this theme to remind ourselves that God is calling us now and today to reaffirm our faith as Christians against all odds. "This is particularly important in northeastern Nigeria where we Christians especially live in fear, in a worrisome context because of the continuing deadly attacks by the Boko Haram militant group on entire villages. He said the attacks were, "mainly targeting churches and Christian institutions of education, but also mosques, military and public places - all in the name of religion." The Associated Press quoted officials Tuesday saying Islamic militants had burned 11 people to death inside their homes in northeastern Nigeria, where frequent attacks have claimed at least 130 lives in the preceding four days alone. The Lutheran convention is held each year and is an open gathering open not only to all Lutheran members and other Christians but the general public as well. The LCCN belongs to the Lutheran World Federation, which has 70.5 million people in its global member churches, which report growing congregations in Africa and Asia. Nigeria is Africa's most populous nation with around 175 million people of who just over half are Muslims and most of the rest Christians. On February 28, the United Nations Independent Expert on minority issues, Rita Izsák, said in Abuja that good and inclusive governance is essential to ensuring minority rights, equality and peaceful coexistence for all of Nigeria's citizens. "I found evidence that in states where inclusive governance prevails and communities placed trust in their leadership, there are fewer communal fractures and concerns about minority rights," Izsák noted. She said, "However, the exclusion of some groups, partisan politics, corruption, and the reality or the perception of bias and favouritism along ethnic or religious lines, fuel distrust, suspicion and anger. The U.N. expert said that political parties need to play a role in breaching "ethnic or religious divides." With over 250 ethnic groups and even more languages spoken in the country, the U.N. expert acknowledged the complex ethnic, religious and linguistic make-up of Nigeria. She also said that for the most part, minority and majority communities coexist in harmony. "I have been saddened to learn that violent attacks perpetrated against both Christian and Muslim communities have heightened suspicions and in some locations created a climate of fear," said Izsák. "I have been deeply moved by meeting victims of violence from different communities," she said. "Those who incite or perpetrate violence, including extremist elements, must be held to account for their crimes and must not be allowed to succeed in creating divisions between communities."